This Neil Armstrong signed "cut" was sent to me recently for review. The moment I took it from the envelope my radar went off because it was not a 3x5 index card, but printer photo type paper cut to the shape of a 3x5 card. I also immediately knew something was amiss because the signature seemed too "flat." It was on the surface of the paper, but there was no ink streaking. So, it was a high quality inkjet print. This "signature" is composed of dots, not ink from a pen. I have seen a number of these printed signatures and it appears to be a growing problem. Often they are matted in a display -- at arm's length and under glass they can be more deceptive. As always, caveat emptor! Neil Armstrong signed baseball: Is it real, or is it Memorex? Once in a while, you'll find a fake autograph and know precisely where it was copied from. In the Fall 2012 RR Space Auction, I reviewed and authenticated this Neil Armstrong signed baseball. Today, I stumbled across this alleged Neil Armstrong signed baseball at Coach's Corner Auctions. In my opinion, the Coach's Corner example was almost certainly modeled from the authentic exemplar offered by RR Auction. But note the slowness, hesitation and lack of confidence in the Coach's Corner ball. This photo closed on eBay today for $1,212. A strong result for a personalized photo with condition issues. To top it off, it's not even an image of Neil Armstrong. Since his passing in August, so much Armstrong material entered the market, I was wondering if prices would actually drop. Yet demand seems to have increased resulting in values holding steady. 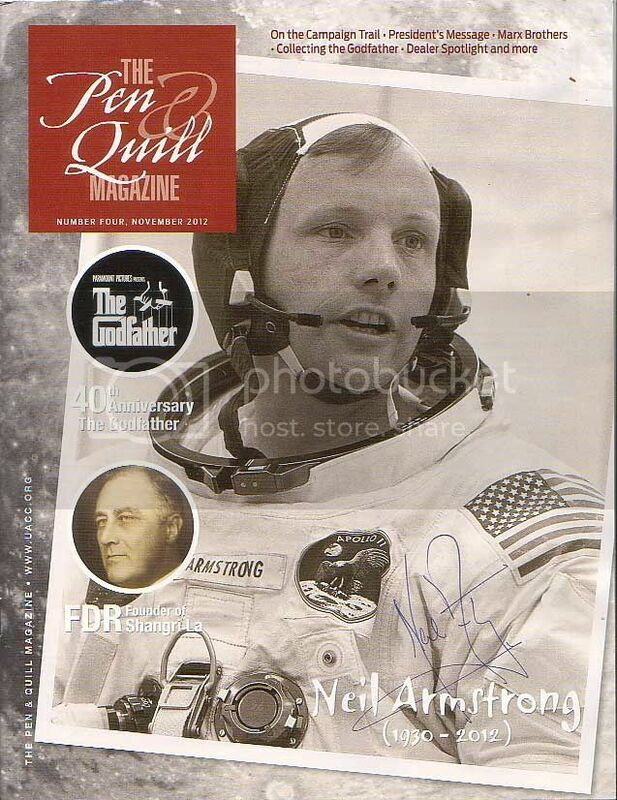 "Apollo 11", "Neil Armstrong", "autographs"
The latest issue of the UACC Magazine Pen & Quill is arriving at member homes. A tip of the cap to the team and editor Tricia Eaton for the November issue, which rounds out a year of terrific issues. It features articles on Godfather autographs, FDR, the Presidential candidates, and the Marx Brothers. Also a Neil Armstrong autograph article by yours truly. For those who may not know, the Pen & Quill is the official publication of the Universal Autograph Collectors Club (UACC). It is available to members of the UACC. For more info on the UACC, go to www.uacc.org. Neil Armstrong, 1930-2012. Patriot, pioneer, hero. Words cannot express the admiration I had for Neil Armstrong. Patriot, pioneer and hero. Finding a Neil Armstrong or Apollo 11 forgery is hardly a newsworthy event. They haunt the hobby like the ghost of phantom forensic document examiner Nicholas Burczyk. World's least deceptive Apollo 11 forgery? Of course, the item would not be complete without a certificate of authenticity from a forensic document examiner. In this case, the "expert" forensic document examiners at Academy of Manuscript and Autograph (AMA) deemed this gem "authentic." "Academy of Manuscript and Autograph", "Apollo 11", "Forgery", "Neil Armstrong", "Nicholas Burczyk", "autographs"
Here's an interview with UACC Vice President, Anthony Pizzitola regarding Neil Armstrong's autograph policy. Kudos to Anthony for getting a great interview to plug the UACC Study, Neil Armstrong: The Quest for His Autograph. Two of the images used in the graphics are items from my collection! "Apollo 11", "Forgery", "Neil Armstrong", "UACC"
The UACC has released a comprehensive new signature study on Neil Armstrong. Run -- don't walk -- to get your copy today at Amazon.com. I will first admit that I am not completely unbiased as I contributed one chapter to this study. The study -- commissioned by the Universal Autograph Collectors' Club (UACC) - is quite comprehensive and includes contributions from a wide range of respected figures in the autograph collecting hobby. It has a multitude of authentic signature examples and will be helpful to any collector looking to learn, authenticate or purchase a Neil Armstrong autograph. It also includes a good deal of narrative and biographical information on Armstrong. And it is a real "book," not a flimsy pamphlet. I highly recommend this as it belongs on the reference shelf of any serious space or autograph collector. Most experienced autograph collectors know that signature placement can be a key clue to help determine authenticity. While sometimes signature formation may be debatable, the signature placement is an additional tip-off that there may be an authenticity problem. This doesn't apply to all - or even most - celebrities. But there are certain celebrities that demonstrate very consistent signature placement patterns... and savvy collectors should pay great attention to such habits. Neil Armstrong is one celebrity with a very specific signing habit. Neil Armstrong has signed tens of thousands of NASA White Space Suit (WSS) portraits in the past 30 years. The vast majority of these are inscribed. Armstrong typically signed with his infamous fading blue marker, with the signature located near his left elbow. It's no secret in the collecting community that he usually signed in this area. So, for years I used this as a general guideline as to where his signature should be. It was only recently that I made the connection as to where his signature shouldn't be. I was recently chatting online with another collector who had asked me to take a look at a couple of Armstrong WSS signed photos. I make no claim to be an expert in the signature of Neil Armstrong. However, after getting burned with a forgery a couple of years back, I've made it my mission to study his signature closely and learn his characteristics. So, I feel comfortable offering an informal opinion in some cases. The signatures the collector showed me appeared to be forgeries. There were several atypical formation characteristics plus unusually high signature placement. After detailing the unusual characteristics, I said, "Also, this signature is touching the flag patch on his shoulder, that means it's too high." I had always used the flag as a boundary to know when a signature was wandering too far from its typical placement. Then referring to another (authentic) example, he responded, "That's funny, the inscription doesn't go near the flag either." Armstrong doesn't write on the flag! The flag patch area was more than just a "boundary", it was sacred ground not to be written over. "Could it be this simple? ", I asked myself. I frantically searched through every authentic exemplar I could find. Sure enough, I couldn't find one where his handwriting went over the flag patch area. In cases with unusually long inscriptions, the odd line spacing indicates that he intentionally avoided writing over the flag area! The next morning I contacted some friends with my findings. I asked them to review the theory and see if it sticks. Among the friends I contacted were such renowned collectors as Al Hallonquist, Gerry Montague, Russ Still, Bobby McLeod, Mike Joner, Rick Cigel, Ken Havekotte and Donnis Willis. Together, we searched our personal archives, past auction catalogs, and online sources. In all, we examined over 100 Armstrong WSS portraits. The flag theory was 100% accurate. In a few cases, his writing may slightly brush the outer perimeter of the flag, but it never intruded into the interior of the flag. Ironically, after presenting the theory, I learned that Mike Joner had independently arrived at the same flag conclusion as I did based on a previous conversation we had about Armstrong signature placement. Given the sample size and the 100% accuracy thus far, the flag test is a highly effective authentication technique. Even if an undoubtedly authentic exemplar came to light where there is writing on the flag, it does not nullify the flag test. It would still be safe to say that the flag test would be accurate in the vast majority of cases. Neil Armstrong's autograph is one of the most widely forged autographs. In many cases, simple signature analysis will weed out non-authentic material. Unfortunately, there are many deceptive forgeries in existence. Luckily, many of the better forgeries fail the flag test. This is a simple test that someone with no signature analysis skill can apply. Also, bear in mind that uninscribed WSS are rare, and almost all the Flag Test failures we found were uninscribed. This further supports the fact that the Flag Test does weed out suspect exemplars. Of course, unless we examined every Armstrong WSS in existence, we cannot say this theory will hold true 100%. However, given the findings thus far, any WSS with writing or signature over the flag should be viewed with great skepticism. Article by Steve Zarelli. The following fine people contributed and made this theory possible: Rick Cigel, Al Hallonquist, Ken Havekotte, Mike Joner, Bobby McLeod, Gerry Montague, Russ Still, John Wardell and Donnis Willis. A collector recently send me a photocopy of a response he received from Armstrong's office. 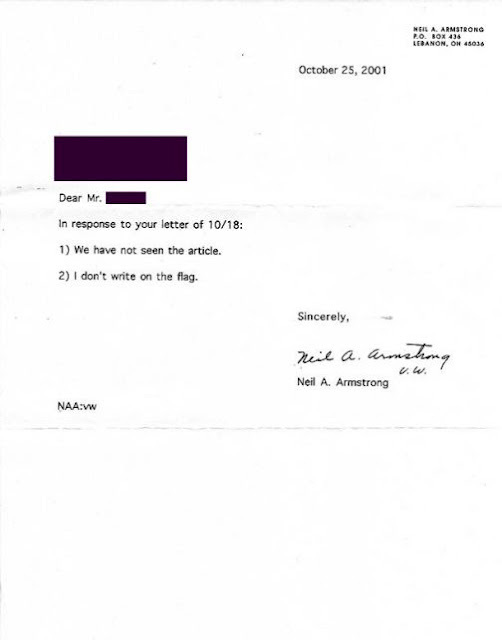 In short, Armstrong verifies the Flag Test by stating "I don't write on the flag." The collector wishes to remain anonymous, so his name has been blacked out. "Flag Test", "Forgery", "Neil Armstrong"
Speaker Nancy Pelosi got dissed by astronaut Neil Armstrong after a ceremony at which the California Democrat honored the moonwalking hero and his historic Apollo 11 flight. After the event marking the 40th anniversary of Armstrong's "giant leap for mankind," held in the Cannon House Office Building on Tuesday, an admiring Pelosi approached Armstrong with pen in hand, a witness to the snub tells HOH. Pelosi asked the publicity-shy former astronaut to autograph something for her, but he wouldn't oblige. "I'm sorry, I don't do that anymore," Armstrong informed the autograph-seeker. Turns out, Pelosi shouldn't take his put-down personally. Armstrong reportedly refuses all autograph requests, no matter how powerful the person asking. He stopped giving out his John Hancock years ago, news reports say, fearing forgeries and concerned about those making large amounts of money from autographed items. In fact, Pelosi took getting turned down in stride, spokesman Brendan Daly says. "The Speaker would go to the moon and back to try to get what her grandson asked for," he tells HOH. "But he learned a valuable lesson: You can't always get what you want." "Nancy Pelosi", "Neil Armstrong", "autographs"